Mutt and Jeff is an American expression that refers to the pairing of tall with short. This combination of contrasting opposites has been the foundation of many comedy teams of Vaudeville, movies, and of course animated cartoons. Ren and Stimpy, Fred Flintstone and Barney Rubble, Yogi Bear and Boo-Boo, as well as Rocky and Bullwinkle are just a few examples. It all started in 1907, when Harry Conway “Bud” Fisher created what is considered to have been the first daily comic strip with continuing characters. The result was the famous Mutt and Jeff comic strip, which was a popular newspaper feature for 75 years. 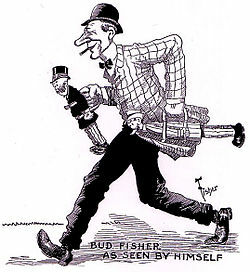 Bud fisher was the first newspaper cartoonist to become a true celebrity. And he was the first cartoonist to make a fortune in the field of comics at a time when most cartoonists made modest salaries. He began as a sports cartoonist for the San Francisco Chronicle around 1905. Fisher soon graduated to more sophisticated political cartoons, which displayed greater artistic skill. It was during this time that Fisher developed the incurable gambler, known as Augustus J. Mutt. This character first appeared on November 15th, 1907 in Mr. A. Mutt Starts to Play the Races. The story line was told through installments, which boosted the sales of newspapers, and in the process, the daily comic strip was born. In 1908, Augustus J. Mutt met the short, dim-witted Edgar Horace Jeffries. The contrast of the two figures proved to be a great source for comic situations, and rest was history. 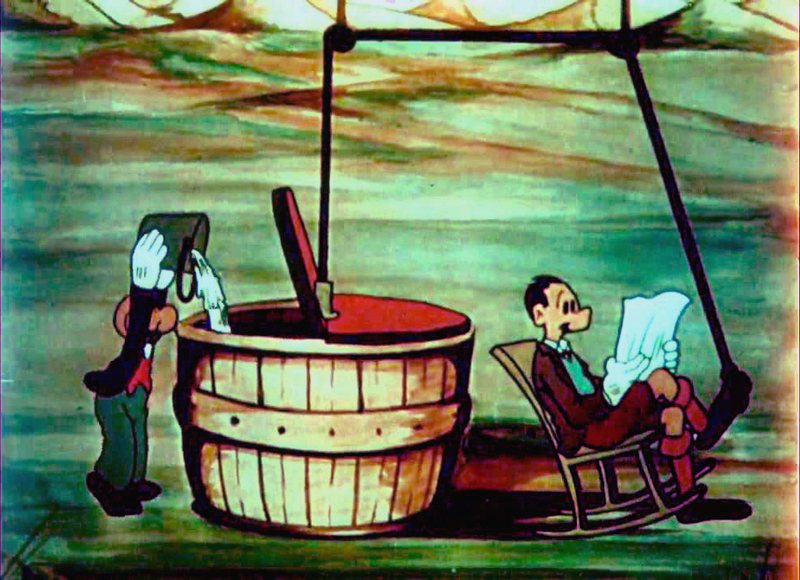 By 1914, animated cartoons were becoming a regular part of the movie program. Many newspaper cartoonists lent their hand to the animation process with varying degrees of success. But most of these early screen cartoons lacked audience appeal. Paul Terry was another San Francisco cartoonist and realized the potential of Mutt and Jeff as an animated series. But the deal never materialized. Eventually, an animation contract was secured in 1916 with Charles Bowers and Raoul Barre’. 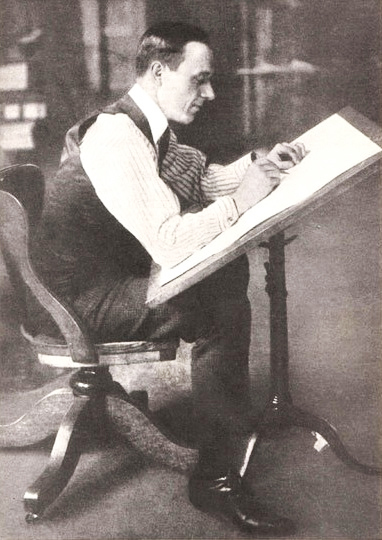 Barre’ had the distinction of having established the first studio to produce animated cartoons for theaters, preceding the more famous Bray Studio. Although the defiance of gravity is now considered a cartoon convention, it originated with the Mutt and Jeff cartoons when the cameraman forgot to include a background element while shooting a scene. The result was a new source of humor that only animation could provide. Mutt and Jeff were world famous… engrained in American culture. They were among the first comic strip properties to successfully translate to the screen, and were the earliest animated characters to display appealing personalities that appealed to working class America. They generated countless merchandising items, and inspired the “Camel Walk” dance based on the way Fisher drew walk positions-in opposing bent and straight legs. All of this contributed to the celebrity and wealth of Bud Fisher. Then something happened to change it all. Sound! In 1931, the Van Beuren studio made an attempt to copy the Mutt and Jeff format with their own version they called Tom and Jerry—not to be confused with the famous cat and mouse team that would follow a decade later. 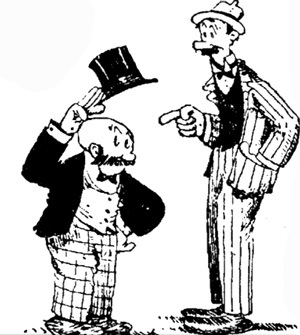 Although the situations were good, this imitation of Mutt and Jeff was a pale reflection of the originals largely because of the poor character design and undefined personalities. So the obvious question is why didn’t Mutt and Jeff make the transition to sound? The animated Krazy Kat began as an animated series in 1916, the same year as Mutt and Jeff, and continued into the sound era until 1940. So the question remains, why didn’t Mutt and Jeff make this transition since they were so popular? The last Mutt and Jeff cartoon was the Globetrotters, produced in 1926. It was essentially a Mutt and Jeff travelogue constructed of sequences from previous releases. While this saved money, it was an indication of Fisher’s declining business judgment. After ten years of production, he closed the studio, relying on re-releases of the old cartoons for the next four years. From a business perspective this appeared very profitable, since it eliminated the expense of original productions. But within two years, the film career of Mutt and Jeff would be in jeopardy. 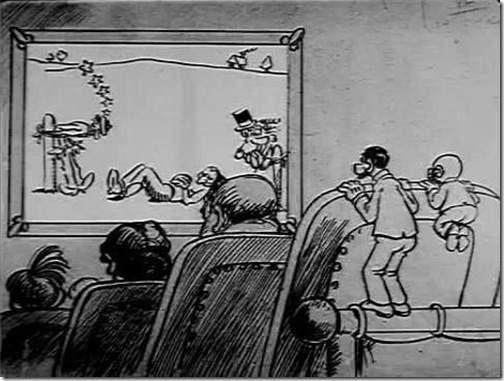 Beginning in 1928, exhibitors were demanding sound cartoons. Fisher’s library of silents was now difficult to distribute, and the major film companies had signed with established cartoon producers for new product. 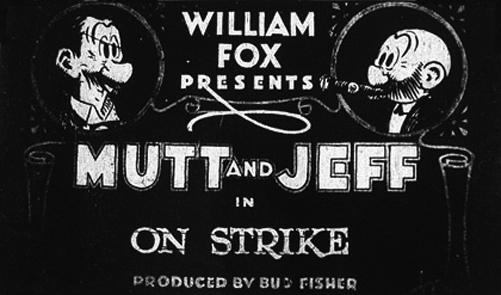 Although Fox was one of the original distributors for Mutt and Jeff, they were now committed to the Paul Terry product. This was ironic since it was Terry who first approached Fisher about an animated series 12 years before. Why Fisher did not approach Terry is unknown. But it can be assumed that differences between the two men going back to the original deal may have been the cause. The only other producer capable of reviving the career of Mutt and Jeff was Max Fleischer. He had a solid distribution arrangement through Paramount, and had the resources to produce a well received Mutt and Jeff sound series. But the complications of the Paramount organization and the licensing of the characters may have seemed unacceptable to Fisher. 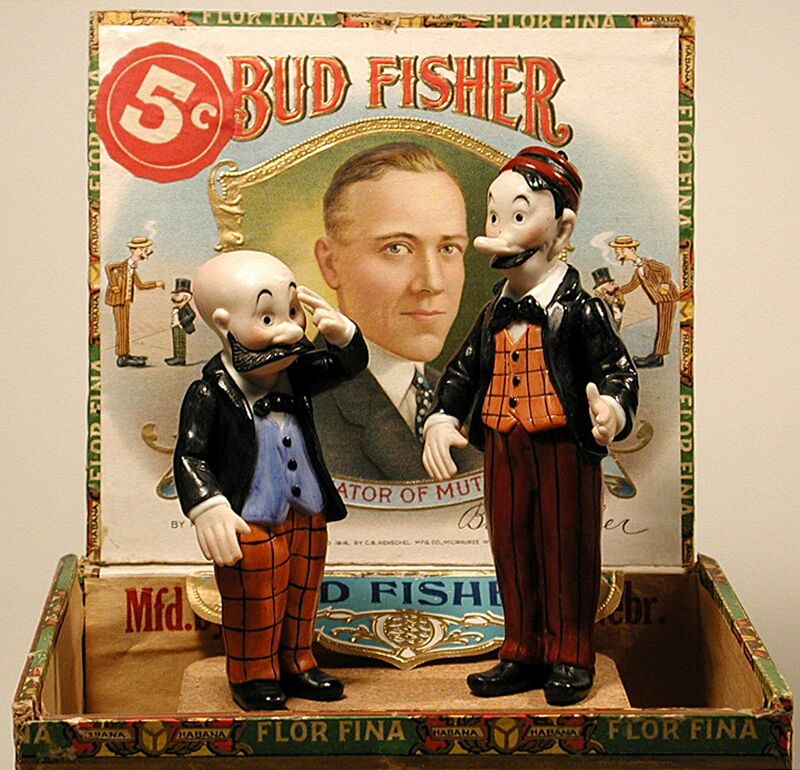 Considering the tremendous success of the animated Popeye series, we and only imagine the results if Mutt and Jeff had been allowed the Fleischer treatment. Bud Fisher continued to believe in the value of Mutt and Jeff, and set out to exploit them his own way by remaking a number of the cartoons from the mid 1920s in color with added soundtracks. While there is some legal controversy surrounding the color remakes “presented by” M. Kleinerman’s Screen Attractions Corporation, the majority was released by a small distribution company, Modern Film Sales Corporation. In both cases a cheap route was taken due to the added expense of sound and color production. The cartoons were careless copied from the originals with sloppy camera work that made the animation look cruder that it was. This process, not to be confused with Ted Turner’s “Colorization Process,” was repeated by Fred Ladd in the 1970s with his remake of Mutt and Jeff with modern music tracks. It was also applied to the black and white Looney Tunes, Betty Boop, and Popeye cartoons. 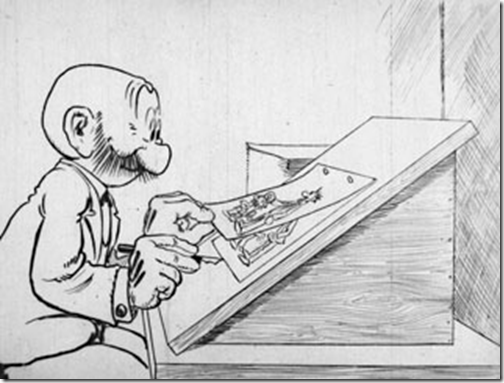 Animation techniques had continued to advance beyond the level of the mid 1920s–a fact that Fisher seemed unable to recognize. He seemed to believe that the name value of Mutt and Jeff with the additional element of color would compensate for the deficiencies. And while the soundtracks had competent musical scores, the use of kazoo noisemakers as vocal substitutes was an annoying detractor. On one level, this may have been an economic measure. The need to pay voice actors was eliminated, and the sound effect transcended language barriers, ensuring foreign bookings. But the poor animation techniques combined with this annoying dialogue sound effect destroyed the screen career of the original Mutt and Jeff. From the beginning, Bud Fisher understood the value of his successful creation. And while he enjoyed fame and fortune, he took all the credit while others did the actual work. Even in the production of the animated series, he was credited as the producer, but had nothing to do with their production and appeared only when royalties were paid. In spite of it all, Bud Fisher beat the odds, proving that it was possible for a lone cartoonist to win against big business and achieve personal wealth. But most of all, Bud Fisher created one of the most memorable comic teams, and the first great animated duo that set the pattern for all that followed. I am a student at UNC Charlotte. During my first semester there, in Fall 2013 I took an American Comics course. Comics before 1945, so in that class Mutt and Jeff was mentioned and looked at as well. The early comics in that course were very good, we even saw some of the animated and live action versions of the strips. The antics of Mutt and Jeff where among some of my favorites we looked at in class. Tentacle Tuesday: the friendly octopus – Who's Out There?